The official #ISTE17 Conference logo! I just finished my 9th year in education and it was another great one. It was very different from my previous eight years, but I've really enjoyed the change of pace and the challenge of working with more than my individual class, grade level, and school. One thing has been pretty consistent with most of those years of teaching, my desire to attend educational conferences to learn and grow in my profession and meet other amazing educators. I've had the absolute pleasure to attend many conferences in my time as an educator, but there is one conference that I have tried and tried to attend for many years that has always found a way to elude me, sometimes at the last minute. That conference is none other than one of the largest EdTech conferences around, the big kahuna, ISTE! Well, the wait is coming to an end this summer because I am so excited to announce that I will FINALLY be attending #ISTE17 in San Antonio, Texas and I couldn't be more excited! But wait, there's more because not only am I attending #ISTE17 but I will also be speaking at #ISTE17 as an Ignite Speaker on Sunday, June 25th @ 1:30pm (CDT)! I am so excited for this opportunity to not only attend #ISTE17 but also get to share the stage with some amazing educators who I consider friends, even though we haven't even met in person yet! If you attend the session you will hear from amazing people like Jaime Donally (who I have been blessed to meet IRL and she's even more amazing than she is online folks! ), Kerry Gallagher, Tara Linney, Holly Clark, and ten other amazing educators who I don't know yet but am excited to meet and learn with while there! I am over the moon excited, and also more than a little nervous, to be speaking at #ISTE17 but it's something that I LOVE to do, share my passion for education with anyone who will listen, or read. The #PassTheScopeEDU crew will be at #ISTE17! So how is this all possible that I'll be able to attend ISTE this year where I haven't been able to do so in the past? Part of the answer is I was selected to be an Emerging Edublogger, which grants me access to the conference for $FREE as a credentialed member of the media. I will be writing blog posts before, during and after my ISTE experience as well as working with my #PassTheScopeEDU crew to make sure the entire event is properly live streamed via Periscope. I plan to scope alongside my #PTSEDU crew of Stacy Lovdahl (also an Emerging Edublogger for #ISTE17), Brian Smith, Toutoule Ntoya, Dan Kreiness, and hopefully Valerie Lewis, the founder, and visionary of #PassTheScopeEDU along with many others who are still figuring out their ISTE schedules. And in order to get ourselves ready for #ISTE17, Brian and I will be scoping the 2017 Badge Summit happening on Saturday, June 24th also in San Antonio, TX. So if you don't already have plans for the Saturday before #ISTE17, you should consider checking out Badge Summit and come say Hi! while you're at it. I understand there are TONS of amazing things to do at ISTE more than the awesome learning from sessions and I hope to enjoy as many of them as possible. And as such, I've already RSVP'd to many great events so I can try to get a full view of just why all my friends keep talking about the great that is ISTE! So if you have any suggestions for a newbie, please feel free to reach out to me and let me know what I should be attending and be doing to make my ISTE experience the best. The best place to find me online is Twitter at @lars3eb or you can leave a comment here on this post or via the contact form on the Contact Page. 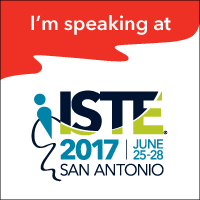 I promise to respond to your comment and look forward to seeing what y'all think I should do at #ISTE17. Be sure to keep an eye out for more #ISTE17 posts that will be appearing here before, during, and after the conference. They will all be tagged with the #ISTE17 tag so they should be nice and easy to find.